Alex Wood's bid for a memorable homecoming was undone by his inconsistent command and a suddenly vibrant offense that helped the rejuvenated Braves claim an 8-1 win over the Dodgers on Tuesday night at Turner Field. Tyler Flowers matched a career high with four hits and Jeff Francoeur notched his own multi-hit game for the Braves, who have won four straight since opening the season with nine consecutive losses. Flowers notched an RBI single in each of his three at-bats against Wood and Francoeur fueled a two-run first inning with a bases-loaded sacrifice fly. "It's not the way we wanted to start, lose nine and then win four," Francoeur said. "But at the same time, [heck], you might as well keep going." Wood, who spent most of the previous three seasons with the Braves, was burdened by two costly errors and the command issues he displayed while allowing six runs -- three earned -- over four innings. Because he was pitching on short rest in place of the ill Julio Teheran, Braves starting pitcher Williams Perez lasted just 3 1/3 innings. Ryan Weber stranded the two runners he inherited in the fourth inning and earned his first career win after limiting the Dodgers to one run over 3 2/3 innings. Fourth-inning insurance: After Perez exited with a 4-0 lead in the top half of the fourth, Wood retired the first two batters he faced in the bottom half before the Braves started a rally with a Freddie Freeman walk and an error by Corey Seager. Francoeur followed with his second RBI of the night to set the stage for Flowers, whose third RBI single gave the Braves a 6-0 lead. "A lot of them came out swinging early, especially in the first inning. It surprised me a little bit on some of them," said Wood. "[Nick] Markakis, Freddie [Freeman], those guys have started swinging a lot earlier in the count. I had to adjust. But with my fastball command what it was, it was kind of tough to battle between the aggressive hacks and not being able to throw it where I wanted to." Immediate need: After being forced to use Matt Wisler, who was originally slated to start Tuesday's game, in the 10th inning of Sunday's win, the Braves promoted Weber from Triple-A Gwinnett to serve as a long reliever. Perez kept the Dodgers hitless before surrendering consecutive one-out hits in the fourth. But the right-hander was wavering, so Braves manager Fredi Gonzalez signaled for Weber, who limited the Dodgers to the fifth-inning run that was tallied courtesy of two well-placed singles that eluded second baseman Daniel Castro. "Perez was struggling," Gonzalez said. "He had walked three up to that point and the swings were starting to get better. He did his job. He came back a day short because of Julio. I'm a believer in putting guys in position where they're going to be successful. We had a four-run lead at the time and I didn't want to mess around. So, we brought Webby in. That was my thought and it worked out perfect." Whoops, there it is: Los Angeles was uncharacteristically shaky fielding behind Wood. The Dodgers, who entered the game with the best fielding percentage in the Majors, were charged with a season-high three errors, leading to three unearned runs. Prior to Tuesday night, Los Angeles had committed only four errors and had allowed just one unearned run. Third baseman Justin Turner committed two of the miscues. He had been perfect in 27 opportunities coming into the game. Seager also hadn't committed an error before his fourth-inning miscue. "That extends innings and gets guys up to the plate, kind of gets them rolling," said Seager. "They move around, they move up bases on you. It kind of changes the whole atmosphere of the game." "He was only hitting [.130], but this kid is going to keep developing and we're glad he is developing in the big leagues." Gonzalez, on Mallex Smith, who highlighted Tuesday's career-high three-RBI game with a two-run double in the seventh. Flowers' four-hit game was the third of his career and his second within his past eight games dating back to Sept. 30, when he notched four hits for the White Sox. 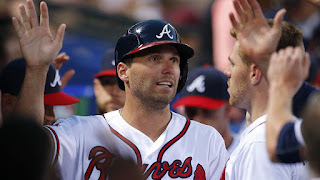 Francoeur's multi-hit game was his first for the Braves since July 9, 2009 -- the day before he was traded to the Mets. Dodgers: The Dodgers play the middle game of this three-game set, with first pitch set for Wednesday at 4:10 p.m. PT. Rookie righty Ross Stripling will make his third career start and look to continue the roll he's been on. The 26-year-old has allowed three earned runs in 13 1/3 innings. Opponents are hitting .116 against him. Braves: Teheran will take the mound when Atlanta resumes its three-game set against the Dodgers on Wednesday at 7:10 p.m. ET. Teheran was scratched from Tuesday's start because he carried a fever while battling a cold on Monday. The right-hander has struggled in his past two starts.